In this current era of technology, staying up to date on the latest innovations in foot care is vital to ensure that we’re giving our patients the very best solutions available. The world of treatments for nail fungus has changed dramatically with the introduction of nail laser therapies. This new process far outstrips the success rates of topical and oral medications while ensuring a safe and hygienic treatment. This laser uses specific and concentrated light wavelengths to promote increased circulation and growth in damaged tissue cells. It also has an effect on increasing the growth of new tissue cells. By increasing circulation through the laser energy, more blood, oxygen, and nutrients are brought to the infected toenail, therefore giving the tissue more of the necessary ingredients than would normally be available. Because the feet and toes are furthest from the heart, your body has to work extra hard to get these items to them. The Laser focuses on eliminating the source of the infection and can also help reduce any swelling or inflammation. laser toenail fungus treatment (also spelled pinpointe) is a very new treatment option for those suffering with the infection. Before sufferers had to choose between home remedies that are not always effective, over the counter treatments or prescribed medication from a doctor that comes with serious potential side effects. But now there is also laser toenail fungus treatment. Having a toenail fungus infection can actually have a surprisingly big impact on your life. It makes the area more sensitive and painful, and the unsightliness makes summer time when everyone else is wearing sandals embarrassing. It affects how you feel about yourself and therefore impacts on your social and work life. 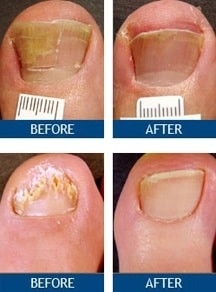 laser toenail fungus treatment is very easy to do. There is none of the hassle of making foot baths or remembering to do applications several times a day for months. You visit the office, for most just one visit is enough, for others a few may be needed if the infection is severe. There is no real pain; the doctor using the laser exposes the fungus to the laser light which kills it. Plus unlike other treatments which struggle to reach the fungus under the nail, Laser toenail fungus treatment gets deep to where the fungus is in the nail bed. There is no damage to the surrounding skin or tissue. A visit takes less than 30 minutes and so far studies show a 90% success rate. Healthy growth of the nail will be visible within 3 months, and the whole nail should be healthy within 6 to 9 months.